If they are looking at you, they are the guards . . . guarding. I was instructed to do this first inspection after their arrival last Saturday. Today is June 25, 2018. I found the 1:1 syrup jars empty on the top hive cover with the central ‘hand hole’ where the mason jar sits. Those were replaced with fresh syrup. The new frames (6 each hive) are still empty and most of the action is still on the original brood frames of the original nuc. I saw live larva without any ‘cover’ and quickly checked my manuals, seems thats ok. My smoker was not co-operating with the burlap and pinecone tinder which kept going out. I did gently smoke the bees out of the way, whether they were looking at me or not- I didn’t notice (they scurry down into the frames) I was more concerned with getting a handhold on the packed with bees brood frames but this wasn’t much of an inspection. I should have found both queens. They are marked with yellow dot. One alarming detail which may suggest a missing queen are the raised drone cappings on worker cells. 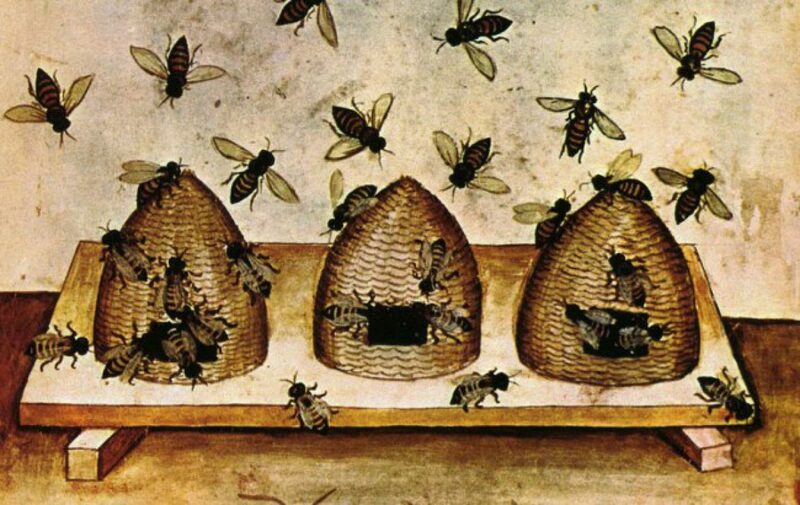 In the absence of a Queen, worker bees can lay eggs, but only for drones. The raised dome is to accommodate the larger sized bee. The presence of these cells signals the end of this colony. The weather today is: nondescript, cloudy, a muggy damp. The bees were moving in slow-mo, like myself. Rain is imminent.